Accorded by some as being the most effective and long-lived military institution known to history, Rome’s military was the key to its rise from a relative backwater settlement in Italy to the most dominant power of the ancient world. Throughout its millennia-spanning history, Rome’s military underwent substantial changes as it contended with challenges both within its expanding borders and from neighboring adversaries who threatened to harm the integrity of its borders. Here is a crash course on the evolution of the Roman military. Rome was little more than a pathetic little hilltop town ruled by smelly chieftains and their ragtag band of warriors. There was a cavalry force composed of the town’s richer citizens. According to the Roman historian Livy, the army at the time consisted of exactly 3,000 infantry and 300 horsemen, one third from each of Rome’s 3 founding tribes. Raiding villages and stealing cows were the main activities. The Etruscans occupied the cow stealing menace and brought civilization. Servius Tullius, the second of the Etruscan kings reformed the military. Service became a civic duty and all propertied able-bodied men were expected to serve. The new centurii army delegated roles based on the social status of men, with the richest snobs serving as cavalry and the poorest as missile troops. With the start of the Republican era, infantry ranks became less stratified. Experience in the Samnite Wars brought further changes to the military. The familiar army formation known as Legio (legion) appeared during this phase, each comprising of around 5000 men. Each Legio was further divided into subunits of 120 men called manipulus (maniples). On the battlefield, this manipular legion was organized into four lines: 1st) the velites (light skirmishers), 2nd) the hastati (heavy infantry), 3rd) the principes (experienced heavy), and the triarii (elite veterans). Legions were further supported by cavalry, which was still a domain for the rich, as well as various light units. Swords known as gladius replaced spears as the primary weapon of Roman infantry during this time. The devastating Punic wars brought with it a shortage of manpower and as such, the criteria for recruitment of soldiers was relaxed and men will little asses (real name of currency) were finally allowed to join. The once pitiful navy got upgraded into a formidable maritime force ironically modeled after the Carthaginian pattern. A guy called Gaius Marius instituted the Marian reforms and made every citizen eligible to join the military. Former distinctions with the heavy infantry units were removed and in place, the standard legionary of our popular imagination was born! Serving in the military became voluntary, was fix termed and salaried. The new legion structure composed of sub-units called cohorts of 480 infantrymen, which were made up of six centuriae of 80 men each. The centuriae, in turn, were further divided into 8 men squads called Contubernia. Legions additionally consisted of 120 men light cavalry united and a dedicated artillery crew. By the time of Caesar bro, auxiliary troops in various roles supported each of the legions. The Praetorian Guard as a separate elite force was formed during the time. Their duties included murdering the emperors for political ends protecting the emperor and serving as the state’s secret police. To counterbalance the enormous power the Guards wielded, Augustus also formed the Cohortes urbanae, a paramilitary police force in Rome. The military structure remained much the same as during the late Republic though by 1st century AD the size of each cohort was increased to 800 men. 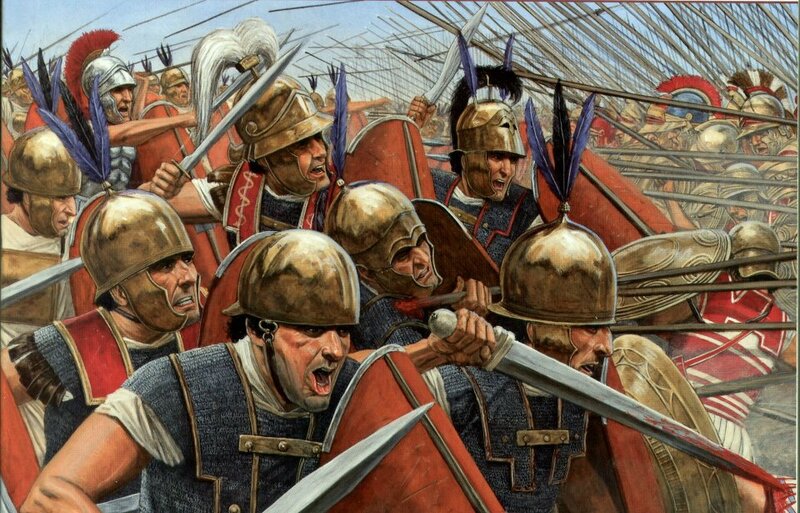 The make-up of the legions also began to change as more and more troops were recruited from outside of Italy. By the end of the 1st century AD, only 22 percent of legions were from Italy. During this period, the size and structure of auxiliary forces and allied troops also got standardized. As the Empire’s borders stabilized following the reign of Hadrian, a policy of fixed border defenses were implemented, requiring troops to be permanently stationed there. As a result, more citizens from the border regions began joining the army and the percentage of native Italians fell to less than 10 percent. The introduction of the Numerii, barbarian irregulars recruited for cheap, further abetted the gradual decline in discipline within the army. Elite heavy cavalry (Cataphractii) was introduced into the Roman Army during this period. Succession crises within and multiple enemy incursion at the borders forced the Romans to adopt a more mobile and versatile military force. The percentage of cavalry in the army increased by 10 folds, with entire regiments composed entirely of this type. Ranged units of all types also began to gain prominence during this era. As political instability destroyed the fabrics of Roman society, so did it took its toll on the military. Citizen soldiers continued to be salaried and professional but an increasing proportion of the armies came to be represented by barbarian mercenaries and allies. Heavy infantry, formerly the core of Roman armies, gradually disappeared in favor of more mobile varieties. Senators, previously enjoying leadership roles, began to be excluded from the army. First politics, now the military, poor snobs. Three distant divisions emerged within the armies of the Empire: 1) Limitanei or border guards in charge of patrolling and defending the borders. 2) Comitatenses and the Palatini who served as mobile field armies. 3) The Scholae or the Emperor’s personal guards; the Praetorian had been disbanded during the reign of Constantine I. A declining population and the pacifist ideology of early Christianity both greatly diminished the recruitment pool available from the Empire’s citizens. To remedy this, the foederatii system was implemented, allowing barbarian tribes to settle within the Empire and in return were expected to defend its borders and provide troops for the military, something similar happening in EU and its service sector. Mistreatment led to frequent barbarian uprisings, most notably by the Goths. High military loses during periods of civil wars resulted in more barbarians being settled en masse, drastically changing the demography of the military as well as the overall empire. By the ending the fourth century, The Comitatenses were divided into smaller regional armies and one under the Emperor’s direct control. The professionalism of the non-federated armies degraded because of declining state venue. The Empire’s borders were neglected as various Emperors or ambitious commanders prioritized their own political interests. The threat from the Huns was only averted with the help of barbarian foederati. Within the decline in the center, the barbarian armies carved their own kingdoms and by 476, the last emperor of the Western Roman Empire himself was unseated by a mercenary officer, Odoacer. The Eastern half would continue for another thousand years, its military evolving and adapting to the challenges it would come to face. ….but that is a story for another day.